Summer in the Pacific Northwest ended and the daily rain (boy it really can rain!) signaled that it was time to move south - but not before the best festival of the year was over. 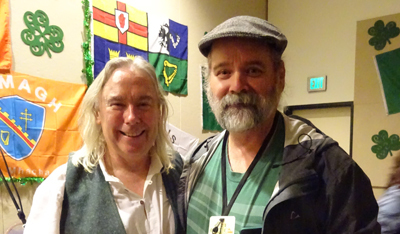 I played the Celtic Feis along with around 35 other bands in Galway Bay, Ocean Shores, Washington - it was a fantastic event. I played 9 shows over 4 days and successfully drank my way through the 5th day... and thoroughly enjoyed it all. I may have some shows popping up in Florida end Nov / Dec, still waiting to hear where and when and I will be playing in the Clep Bar, Dundee, Scotland in December and Freddys bar, Ugchelen, NL for a new year blowout party. January starts well with a gig in my favourite pub in the whole of the Netherlands - Café Back in Town, Ugchelen Friday January 6th 2017. October was a month of finishing off in Washington / Oregon, playing my last three shows, packing up our 5th wheel and truck and setting off on the road again - for the 3rd year. 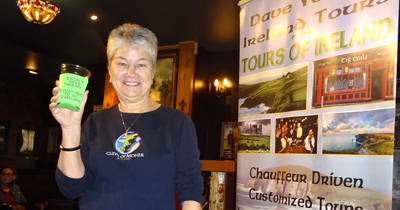 I started the month as I finished it, at the Galway Bay Irish pub the last day of September and the 1st of October. As usual the crowd there were great, enthusiastic and joining in from the 1st song. It was nice to get used to the place again and see the Ocean before the huge festival event at the end of October, it felt like the calm before the storm. 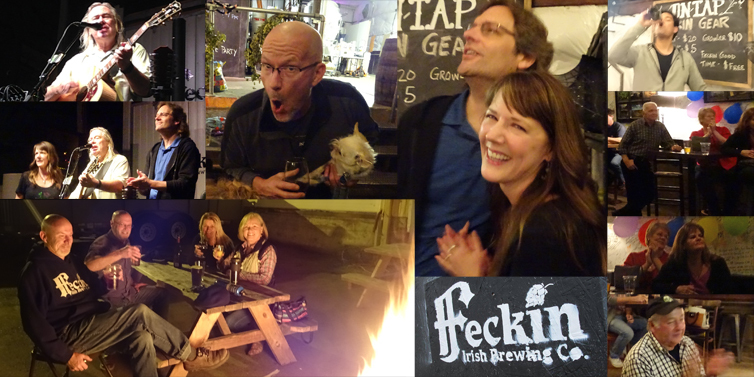 October 8th (the day after Dorothy & my 38th wedding anniversary) was a goodbye to the Feckin Brewery. Memories of the great time I had at the album release event for "Mullen It Over" on Sept 18th were still vivid and it was great to see a nice turnout of my faithful folks - we had a ball... and wee Fergus (the dog) had a treat. 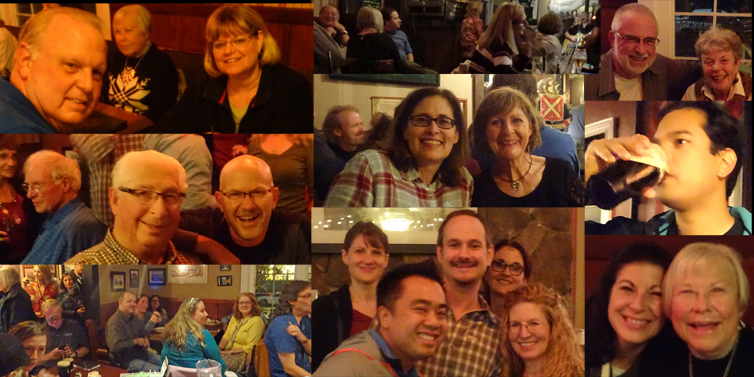 Then it was Mahers Irish Pub, Lake Oswego, OR on Friday October 14th. It was packed full for this last Oregon show. People were in a great mood and good voice as I ploughed through as many favorites and new album songs as I could before we called it a day, 30 minutes over time. It was great, a happy crowd and a great way to finish in Oregon. The last Amazon orders arrived (something you can't do easily on the road), we rationalised what we were taking, cramming more stuff into our storage unit. I swapped out my bagpipes, which we have carried around the USA without playing a note (much to the relief of the inhabitants), in favor of my banjo as I enjoyed playing it again during the album and want to get my deliverance on again! 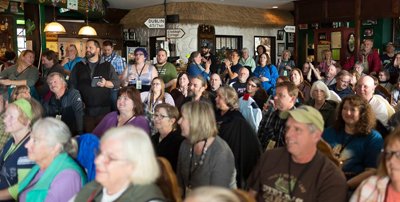 Then it was off to Ocean Shores for the Festival, complete with drink Koozies for Mary Nolan who I would meet there with her Irish tour colleague David Yeates. This was the 1st year the Feis started on a Tuesday (a day early), so I didn't expect it to be busy... wrong! the place was already buzzing when we arrived and the 1st acts had started. The first people I met gave a great howl (and several hugs) when they saw me - they were delighted! They had come especially for me, they had played my CD ragged and were looking forward to the new one. A good start! When I played there last year, I wanted to play my most popular songs for each show but noticed that my audiences were people who had been to a previous set and new people. I had assumed that once people saw me they would go and see someone else as there was so much choice and I would mostly be playing to new crowds... wrong again! This year I went through all the Irish and Scottish songs I know, added in my own new ones and sorted them - I had 99 songs. I then drew up sets for each day so that I wouldn't repeat a song - unless I gor a request for one. Each evening (when I was sober enough to still read) I got the next day's sets ready and got through 7 one hour sets with only 3 repeated songs. My eighth set was 20 miles down the road in Hoquiam, so I reverted to a set of good well-known songs and my last set I chose the ones which had been most popular through the whole event. The result was that I had well filled shows, some standing room only with around half to three quarters of the people who had been to a previous show. They loved it and so did I, I didn't get sick of playing the same songs and the crowd heard songs I haven't played in years... warts and all! I was touched that the most requested songs were my own ones from the new album. One couple told me they'd been to my shows the day before, bought my new CD, went home, listened to it several times, read the book, loved the songs and wanted to hear them all live. I played just about all of them and some were requested a lot. I had a few people tell me that they woke up with "Big Tam" in their head! Now if you've ever met Big Tam... its not a thing you'd want until after about 5pm. I'm feeling good, the hernia operation has settled well and I've lost 25 pound in weight. I dont get so sleepy driving all these miles and I even feel like jogging again - need to nip that in the bud! Wondering how our RV park neighbours will react to my banjo playing - yeee- ha! It's great having two CDs to sell at shows, we sold a lot of the new one (Mullen It Over) and the old one (The Beginniing) was selling well too - it made a big difference! Our good friend Cathi made ear-rings out of my new green pearl "Mullen It Over" guitar picks - they're lovely - and they sell too! The Hawaiian group - I met them last year, Played in Honolulu for them and they're back this year - party animals! After Memphis, we'll drop down South and travel along the Gulf of Mexico until we reach Florida. I'm hoping to have some gigs set up by the time I get there. We'll spend Christmas in Scotland and New Year in the Netherlands - I'm looking forward to being there again, seeing family and friends ... and playing there too. So that's it for another month, we're in Winslow, Arizona right now (there's a song there somewhere! 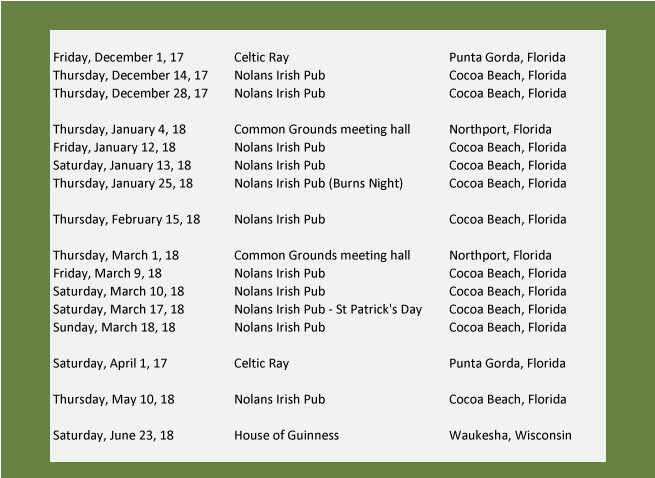 ), next month I'll be writing this from Fort Myers Beach, Florida.